Experience warm hospitality and discover the unspoilt beautiful countryside of Romania on this walking holiday. Travel into the Transylvanian Alps, staying in a local guesthouse in Moeicu and enjoy walks through pine forests and flowered meadows to mountain huts. Arrive Bucharest airport and drive to hotel in Sinaia. Located in a beautiful mountainous region, at the foothills of the Bucegi Mountains, about 120km from Bucharest and 44km from Brasov, in the Prahova Valley, Sinaia is one of the oldest and most famous mountain resorts, often referred to as 'The Pearl of the Carpathians'. After breakfast we visit in the Peles Castle (optional) which is considered by many as one of the most beautiful castles in all of Europe. It was the final resting place for several Romanian monarchs including King Carol I, who died here in 1914. Then we take a short cable car ride to the Bucegi Plateau. From here we start our walk through the Bucegi mountains which make up part of the southern Carpathians and walk for approximately 4 hours gaining about 500 meters in elevation to the highest peak, Omu Peak 2505m. Wind and rain have turned some rocks in to spectacular figures such as the Sphinx. We will finish the walk at the Omu Mountain Hut where we spend the night. 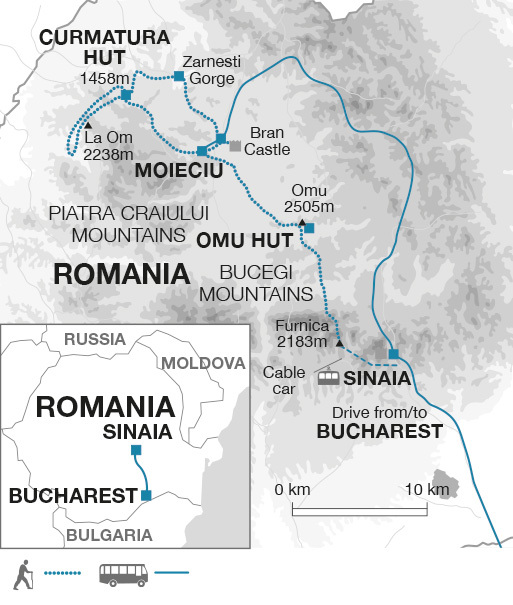 If we arrive early enough there is the option to extend this walk with an additional one and a half hours trek to summit Bucsoiu a nearby peak. Our main luggage is transferred by road and will not be with us so we carry what we need for the night. Today's 13 kilometre trek is expected to take around four hours with 775 metres of ascent and 320 metres of descent. We start our descent, including 50m on a scree path, to the Bran Valley with some stunning views of the Piatra Craiului Mountains. Today we walk from the peak of the Bucegi range to Moeciu and on our way will see natural monuments, various alpine flora and fauna, which could include the edelweiss, mountain wild rose, capercaillie and chamois. This area is also home to the European brown bear but a sighting would be rare. The wild beauty of this area is truly special. Today we walk with some steep sections and rough terrain, good walking boots are essential. The last part of the trail leads us to the guest house through their orchard. Here after a long day we will be welcomed with hot delicious food, locally brewed alcohol and a well deserved hot shower. Today's 20 kilometre trek is expected to take around six hours with 350 metres of ascent and 200 metres of descent. Today we start our day with an optional trip to the castle at Bran. The truth behind 'Dracula's Castle' is even more fascinating than its myths! Earlier this century it was the home of the remarkable British born Queen Marie of Romania, grand daughter of Queen Victoria. Vlad the Impaler, the heroic 15th century ruler of Wallachia never lived here and there is no connection with the excellent novel by Bram Stoker - who never came near Transylvania. Perched on a crag in a valley between two high mountain ranges, it controlled an international trade route, but is now a rural back-water. From here we start our walk to the Piatra Craiului mountains. Piatra Craiului (The Royal Rock) is probably Romania's most loved mountain especially by hikers and nature lovers. The shining glow of this huge white limestone ridge can be seen from afar and it is probably the source of its unusual name. The mountain ridge has the biggest bio-diversity of the country. Not surprisingly, it is a national park. The wildlife is very diverse and there are still black chamois on the high cliffs and brown bear, wild boar, deer and stag, foxes, wolf and even lynx in the forests. The Piatra Craiului Mountains are further known for the abundance and diversity of flowers and plants. We walk today for between five and seven hours and end at a mountain hut where we spend the next two nights. Today's 18 kilometre trek is expected to take around five hours with 1,340 metres of ascent and 660 metres of descent. Today we take a circular walk from our mountain hut to the Piatra Craiului's beautiful limestone ridge, which is about 25km long, from where we have superb views over the surrounding country. The walk today is challenging in parts with the odd section where you may need to scramble over rocks or through dense forest. Once we are up on the ridge the views of the southern Carpathians are spectacular. After around six hours of walking we will return to our mountain hut for a well deserved hot meal and refreshments. Note: During the walk on the ridge there is a section approximately two metres in width which will require holding on to a chain to cross. Vertigo sufferers may wish to opt out of this walk. There will also be a descent of 300m on a scree path. Besides this, today's walk will not operate if it is raining or if there is a threat of rain. If this is the case an alternative walk in the area will be arranged. Today's seven-and-a-half kilometre trek is expected to take around four hours with 800 metres of ascent and descent. Today we leave the mountain hut behind and walk to our guesthouse in Moeciu. Today's walk takes us through more beautiful countryside including the Zarnesti Gorge which has been used as a filming location for a number of movies including Cold Mountain. Today's 18 kilometre trek is expected to take around five hours with 470 metres of ascent and 1,100 metres of descent. This morning we drive to Romania's capital, a remarkable blend of turn of the century elegance and communist excess. Situated on the Danube plain and set amid a series of lakes and spacious gardens, remnants of more gracious days still exist to charm the visitor. We visit many of the older parts of the city to see some of the buildings that have earned it the reputation as the Paris of Eastern Europe. After the city tour we have free time for shopping, relaxing or more sightseeing. Tour ends in Bucharest after breakfast. Bring light and comfortable clothing that can be layered according to the temperature. The weather conditions in the mountains can be changeable, and it can become cool, especially at night, so bring warmer layers. It can get as cold as -5°C during the night and can still be in the minuses the next morning and there may also still be snow on the ground in spring and autumn in the mountains. Tops made from wicking materials which keep you drier and warmer are recommended as a base layer, and walking trousers are preferable to trousers of heavier material such as jeans. A waterproof jacket is essential at all times in case of rain and wind. Bring one main piece of luggage and a 20-30 litre day sack is recommended. You will need to carry what you need for the day which may include a raincoat, jumper, camera, sun-cream, water and picnic lunch. On hot days you will carry fewer clothes but more drinking water. Your main luggage will not be with you on every nightstop so ensure your day bag is large enough to carry everything you might need. For the two nights staying in Curmatura Hut (days 4 and 5) your main luggage will be stored at our accommodation in Moeciu ready for your return on day 6. Although entirely voluntary, tipping is a recognised part of life in this region of the world. Some local staff will look to members of the group for personal recognition of particular services provided. Accordingly, you should allow £15.00 for tipping. In order to make things easier for you, the Explore Leader may organise a group's tips kitty and if this is the case, they will account for it throughout the tour. On this tour we stay well off the beaten track. The two mountain huts that we stay in are well located in the mountains, with fantastic views and meals provided but are very simple. The Omu hut on day two is located at 2,505 metres on top of Bucegi Mountains in the Carpathian Range. The hut is the highest in Romania and also acts as a mountain refuge. There is no running water and no washing facilities, although there is bottled water for sale along with other drinks - beer, mulled wine, some soft drinks. The dorm rooms are communal with a stove in the centre; we are allocated two beds per person to allow for extra space (unless they are needed for people to take shelter). Sheets and pillows are provided and bringing a sleeping bag is recommended. The toilets are located just outside of the main building, a long drop outhouse. The wooden Curmatura hut on days four and five is located at 1,470 metres in Piatra Craiului national park. Washing facilities are limited as there is no running water, although there is a fresh water spring thirty metres from the hut. The toilet is outside the main building. There is more space in this hut, with dorms rooms solely for the group and a large outdoor terrace. Romania: Visas are not required by UK, EU nationalities, Australian, New Zealand US and Canadian citizens. Other nationalities should consult their local embassy or consular office. 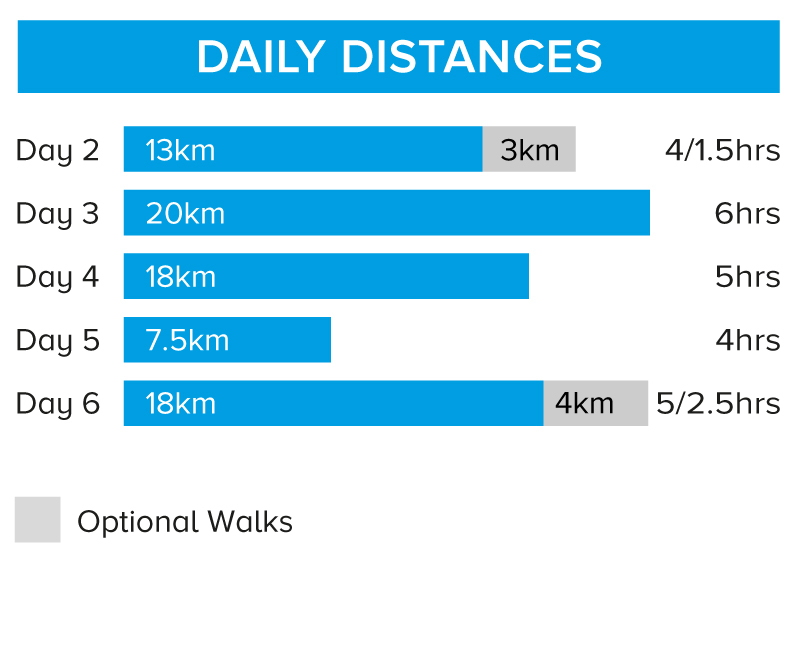 Walks on 5 days for an average of 4 to 6 hours, plus two optional walks. There are some steep ascents and descents through forests and rocky mountain paths.